My husband was always amazed that I didn’t like mussels. I love raw oysters on a Friday night with a split of champagne. Will gladly gobble up clams in any form. Dream of grilled prosciutto wrapped shrimp. And need to have some type of asian prepared ahi tuna regularly. So why the dislike of mussels? Well, it seems all the mussels I had had in the past were huge, stringy, chewy and tasteless. I didn’t know they could be soft, plump and juicy . In France they have restaurants that only make Moules Frites. That’s Mussels and French Fries. They serve every other meal with bread. With mussels you get french fries? They dunk the fries in the broth, that’s the way they like them. While there last month I decided to give them another try. 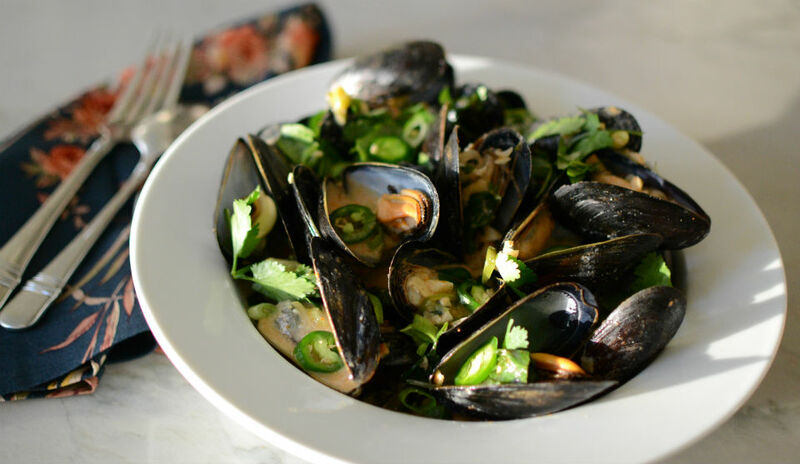 If they have restaurants dedicated to just mussels they had to be good, right? Wow have I been missing out! Not crazy about the french fries though. I prefer a big hunk of GF crusty baguette, for soaking up all the fabulous broth. First open you bag of mussels and inspect for any broken or cracked shells, discard those. Give the rest a little scrub and set aside. Melt butter in large stockpot, add garlic and ginger. Cook over medium heat for 2 mins, until garlic is soft and fragrant do not brown. Add red curry paste, and fish sauce, stir well to incorporate with garlic and ginger. Now add broth and coconut milk, mix well. Cook over med to med high heat for 5 mins. Add mussels, cover and simmer for 5-7 mins. When all have opened ladle into large serving bowl, discard any mussels that do not open. Pour broth over top, scatter the cilantro and squeeze half the lime all over. Serve in warmed soup bowl with an extra wedge of lime.